Seven years ago, some now claim that the only realistic way to stop the war, prevent a jihadist rebound and allow the country to move on is to acknowledge that Assad with help from Iran and Russia will remain in power and to effectively let him win. When the weapons are silent, they say that Syria's other major issues can be resolved: the battle between Turkey and the Kurds in the north; the shadow war between Iran and Israel; and rebuilding destroyed communities so that refugees can return. Some oppose that if the West refuses to invest the resources that needed to determine Syria's future, its efforts will penalize Assad to make life worse for the average syrians. "You do not punish Assad, you punish the poor Syrian people," said Joshua Landis, Head of Center for Middle East Studies at the University of Oklahoma. "If the United States targets counter terrorism, stabilization and refugees return, all of them will fail." President Trump ordered Saturday's strikes, conducted in collaboration with Britain and France, to punish Mr Assad for a clear chemical attack in Douma a week earlier. 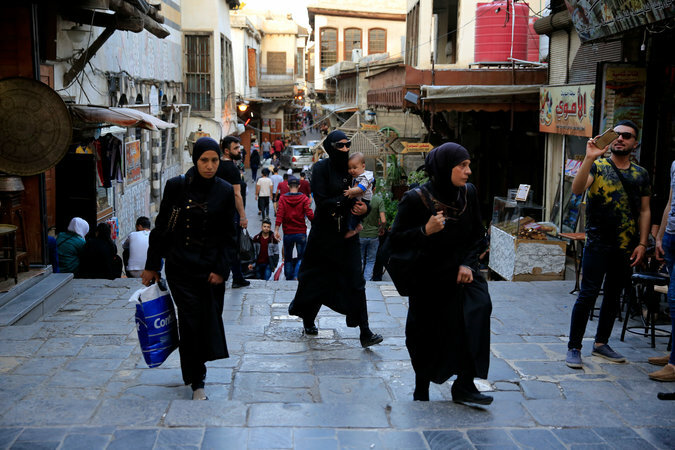 Syrians in the Old Town of Damascus on Sunday. 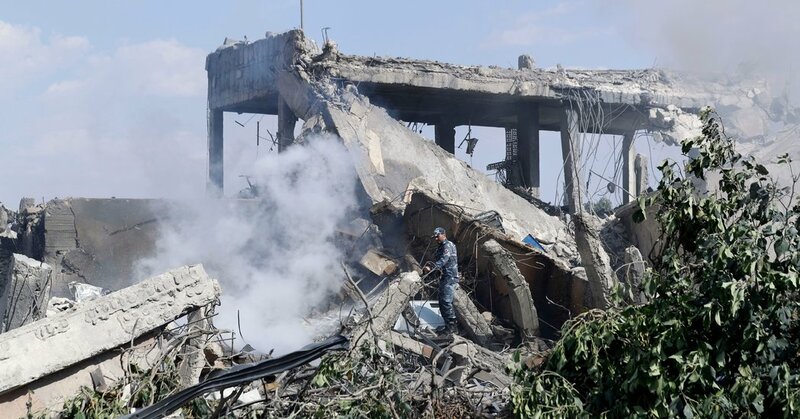 The strike was not aimed at turning Assad, hurting the Russian and Iranian allies supporting their troops or protecting civilians from violence. In fact, they were carefully planned and implemented to avoid changing the overall dynamics of the conflict and keeping the US from going further. The frustrated Mr. Assad's enemies. "The US strike did not change anything for Syrians," said Osama Shoghari, an anti-government activist from Douma, struggling to start a new life in an unknown city 180 miles away from his home. "They did not change anything on the ground." The West's opposition to further intervention is good news for Russia and Iran and, of course, for Assad, who was happy on Sunday, according to a group of Russian politicians who visited him. "President Assad has an absolutely positive attitude, a good mood," said Natalya Komarova, member of the delegation, according to Russian news agencies. But in a confirmation of the toll of the war, another visitor reported that Mr Assad said that the rebuilding of Syria could cost 400 billion dollars. If the first message about the strike was that Assad could not use chemical weapons, a secondary message was that the West would leave him in power, no. Whatever he did. "Although this is a deterrent chemical weapon, it leaves an entire arsenal of conventional means that people can be killed in Syria with few real consequences," said Sam Heller, a senior analyst at the International C Risk Group studying Syria. "There is every reason to expect it to continue." Seven years of conflict have seen Syria dissipated by the world powers, with the Turks managing cities in the north, the United States is working with Kurdish led militants in the East, and Russia and Iran help Assad direct the remaining pockets of rebels elsewhere. No one seems at present to have a realistic plan to measure lasting peace between the forces that would return Syria again in a stable enough way to allow millions of refugees to return home and to rebuild. Many discounts the idea that Mr. Assad can play a meaningful role in that process. "It's very short and wrong in my mind," said Maha Yahya, director of the Carnegie Middle East Center in Beirut. "To facilitate a victory for Assad is to ensure that Syria remains the epicenter of instability in the region." Center research has found that if Mr Assad remains in force, it would counteract the return of Syrian refugees from neighboring countries and Europe. "They will not go back as long as Assad is in power because they do not believe there will be security and stability while Assad is there," said Yahya. 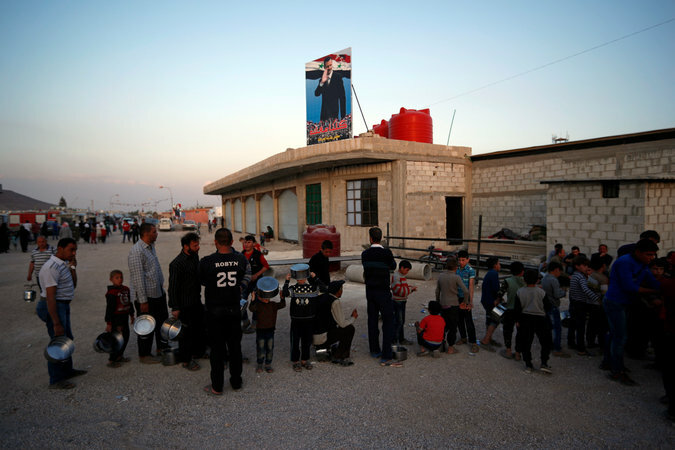 Syrian families displaced from Eastern Ghouta held pots as they waited for food in a shelter in Damascus countryside on Friday. After announcing Saturday's strike, Trump painted a pessimistic view of the United States's ability to implement change in the Middle East. "No American blood or tax can produce lasting peace and security in the Middle East," he said. "It's a troubled place. We'll try to make it better, but it's an unpleasant place." He suggested that Arab Allies could play an increased role, namely Saudi Arabia, United Arab Emirates, Egypt and Qatar. But the first two are weakened in a war in Yemen, and the first three are locked in a bitter dispute with the fourth, making it unclear how they would work to fix Syria. Before the strikes, Mr Trump froze $ 200 million in stabilization support to Syria and said he would bring about the 2000 US troops now in eastern Syria. In addition to working with a Kurdish-led militia called Syrian democratic forces to fight the Islamic state, the states help restore areas such as the city of Raqqa recently driven from the jihadists. Given the huge damage to the city, this is a giant task, said Mustafa al-Abed, from the Raqqa Civil Council, supported by the United States. Among his group's priorities is to establish water and power grids, clear walls from roads and restore irrigation networks so that farmers can plant. But before it can happen, and before residents can return to their homes, the city must be cleared by the many mines and explosive booby sources that the jihadists planted before their defeat. "They are everywhere," Mr. Abed said about the mines. "At home, in cars, on roads. There is no normal size or place. They are everywhere." He dismissed Saturday's strikes, as he said preceded so many threats from Mr. Trump that the Syrian government had plenty of time to evacuate buildings and hide sensitive materials. "They have used all kinds of weapons," he said, of the Syrian government's forces. "So the strikes should have been strong enough to break the back of the regime." The only thing that prevented the government, Russia and Iran from returning to their part of the country was the presence of American troops, he said. He feared what would happen if the United States left. "We will go back to being a region of fighting, as we were before," he said. "We are coming back to battle and fear and blood."